It's two weeks since I last wrote this blog...a busy time. First we had the decorators in.....Kayoko was the boss and I just did what I was told! If she doesn't like it in a year's time then, well, she has herself to blame. 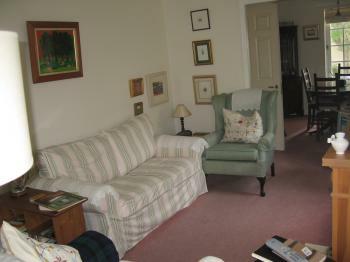 Anyway, the rooms downstairs are ready and I must say that I feel very comfortable staying home now. Getting this far meant not only painting and decorating but also putting together various pieces of new furniture, hanging paintings once again and sorting out books, CDs and ornaments. Now the bathroom upstairs is a complete shell. Getting this far has involved, not only tradesmen delivering all the different items found in a bathroom but also a plumber, a carpenter, a plasterer, and a tiler visiting at different times on different days, as well as an electrician who is upstairs at the moment. They all like their tea so I have been busy making and offering cups galore during the day. Soon, it will all be ready; we've been told that probably it'll be complete by wednesday next week. After that, we're ready for our guests. The first one arrives in mid-July. We're five weeks away from that time. Not long now! 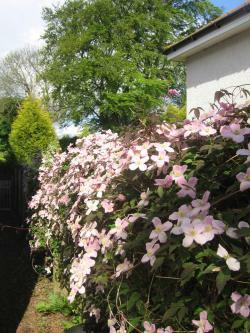 Oh, Kayoko's Clematis won and blossomed well before our house is ready. It looks rather good this year...maybe it is a sign of a good hot summer. Our laburnum is also looking very good this year.